We sell Mirror Shield in 60” x 100’ and is available in 25’ increments. We convert all the measurements into a vectorized image on a CAD style computer program. We can also include an engraved part number in a lower or upper corner that is inconspicuous for easy reorder and placement. We digitally cut your patterns on state of the art CNC machines with .001 tolerance. If your material is damaged in the future, all you need to do is contact us to order the pieces referencing the engraved part number. 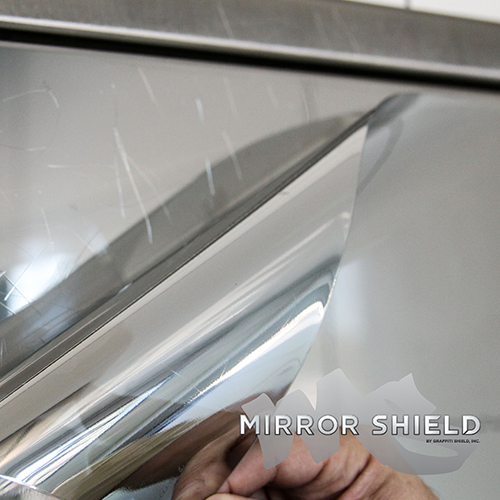 Mirror Shield is a graffiti abatement and obscuring film that offers the reflective look of a mirror while providing protection to the surface underneath. Mirror Shield is utilized across a multitude of industries to help combat graffiti vandalism.